Working all morning at school burns up a lot of energy, so children need healthy lunches to refuel. Children also need lunch to provide enough energy and nutrients to keep healthy and grow as well as possible. Be sure you encourage your child to eat a nutritious lunch every day, either from the school cafeteria or brought in from home. However, just because the cafeteria offers healthy food or you pack a nutritious lunch for your child, doesn't mean your child will actually eat it. You must teach your child to make healthy choices. Remember to start by setting a good example at home with your own eating habits. Through the National School Lunch and School Breakfast Programs, over 33 million meals are served every day to America's children. Although school cafeterias are sometimes accused of offering only unhealthy foods, and many people have heard jokes about "mystery meat," in fact, most school cafeterias offer a wonderful variety of nutritious foods. 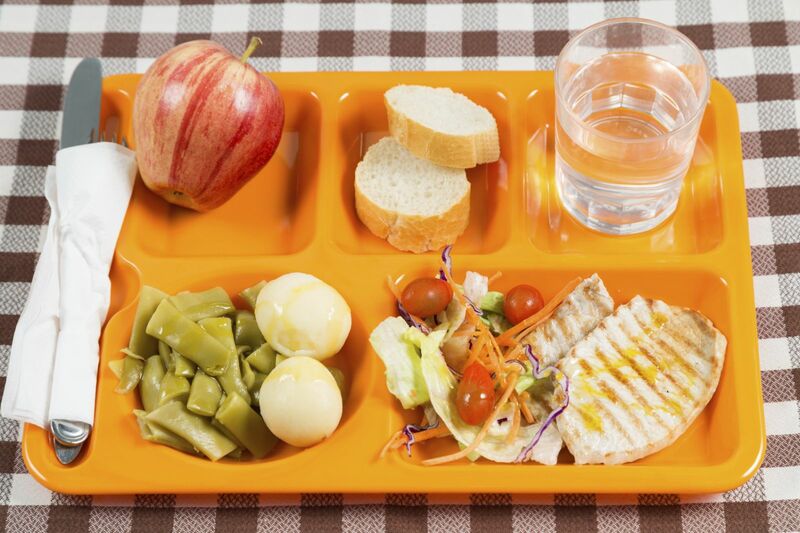 All national school lunch program meals must meet the Dietary Guidelines for Americans, which recommend that no more than 30 percent of an individual's calories come from fat, and less than 10 percent of them from saturated fat. Since most children eat one-third of the calories they need each day at lunch, school lunches also must provide at least one-third of the Recommended Dietary Allowances of protein, vitamin A, vitamin C, iron, calcium and calories. Teach your children to make healthy choices in the school cafeteria. Eat items from each of the five food groups. Although an individual item, such as a hamburger, may be relatively high in fat, when combined with other offerings, the meal probably meets federal guidelines of no more than 30 percent of calories from fat. If your child trades the accompanying salad, apple and low-fat milk for another hamburger, the meal will be too high in fat. Choose more fruits and vegetables. Encourage your child to eat more servings of fruits and vegetables, for example, by adding lettuce and tomatoes to sandwiches, choosing gelatin desserts with fruit, or asking for extra tomato sauce on the spaghetti. Avoid unnecessary fats. Encourage your child to choose lower-fat options when available. For example, spread mustard on a sandwich rather than mayonnaise, drink low-fat or nonfat milk (whole milk is recommended only for children younger than 2 years for brain growth), and choose pretzels over potato chips. Skip the vending machine. Some students have short lunch periods and grab food from vending machines rather than waiting in cafeteria lines. Although convenient, foods in vending machines, such as chips and granola bars, are often not as healthy. Sandwiches travel well and are favorite lunch-bag items. Make them with a variety of breads, such as whole-wheat, oatmeal, rye or multigrain loaves; pita bread; English muffins; bagels; lavash; or flour tortillas. Fill sandwiches with lean meats, egg salad, tuna salad, peanut butter, cheese, hummus or vegetables. Cut the sandwiches into fun shapes using large cookie cutters. Serve potato salad or pasta salad made with multi-color or fun-shaped noodles. Add hard-boiled eggs, beans, peas or small cubes of meat for additional protein. Go easy on the mayonnaise. Cut up raw vegetables, such as carrots, celery, green peppers, broccoli, cauliflower and cucumbers. Send them with a small container of low-fat dip. Include a piece of fruit for dessert, washed and ready to eat, or a container of fruit salad. Try cubes of reduced-fat cheese or string cheese with whole-grain crackers. Few kids can resist yogurt, a good source of protein and calcium, which now comes in many different flavors and forms. Choose healthy snacks. Pack pretzels, popcorn, rice cakes, whole-grain crackers, dry cereal or trail mix. Avoid prepackaged, convenience foods, which tend to be high in fats, and especially those with saturated and trans fats. It is usually cheaper, healthier and smarter to make similar items with your own ingredients. For example, instead of buying individually prepackaged cheese or peanut butter crackers, send whole-grain crackers spread with natural peanut butter or slices of reduced-fat cheese. Involve your child in deciding what to make for lunch together. He is more likely to eat his lunch if he has helped prepare it. Let him assist with choosing a weekly lunch menu, making a shopping list and then doing the grocery shopping with you. When possible, let him actually help you make the lunch, too. Be sure all lunch items are easy to eat. Peeling and slicing fruits and vegetables at home often make them easier to eat at school. For example, juicy tomatoes may drip on a child's shirt, but wedges could be eaten easily and neatly with a fork or even fingers. A child with a loose front tooth could eat apple slices but not easily bite into a whole apple. Keep cold foods cold and hot foods hot. Use insulated lunch boxes. Keep foods cold with ice packs or frozen juice boxes. Send hot foods in a thermos.